Hey there ladies! In this post we are going to show you 15 Modern And Different Ways To Wear Printed Pants this spring and summer, because plain pants are too main stream. Break away from the routine and put your jeans and the other monochromatic pants in the back of your wardrobe and be a stylish diva with the amazing printed pants which can add an attitude to your style! 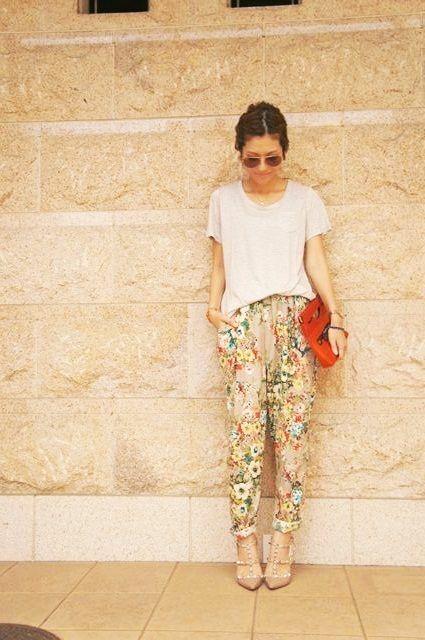 Printed pants are still very much in fashion and they are fun to wear. You can have versatile looks all the time, and you are surely going to be in the center of attention wherever you go because prints will catch all eyes. You can both dress them up or down, according to your occasion, so they can be worn to different events. With this type of pants your outfits will always be unique. If you thought they printed pants are very difficult to style, you were completely wrong. As you will notice from the photos below, you will see that all of the combinations feature plain tops. Choose monochromatic top and there is no chance that you can get it wrong. You will get some pretty amazing outfits and compliments will be rolling in. Do you want to try this trend this spring and summer? I’m sure that you will want as soon as you get your inspiration from the outfits that I have found just for you. The animal print is stylish and classy, and you can’t go unnoticed in it. So, if you want to be seen make sure you put on some animal printed pants! When combining the printed pants with the rest of the pieces from your wardrobe, keep in mind to coordinate the color theme of them. If your outfits features two colors, then you should add a pop of another color. You can get outstanding results if your shoes or bag is in another color. The dotted print is another print that is here to stay for a longer time. This pants make great combinations for work or more formal events. You are going to love them. What do you think, will you be rocking them soon? The floral prints are bright and beautiful and they should definitely be part of your wardrobe for these two seasons. You can find them in any color. They are so fun to mix and match with the rest of your clothing pieces and accessories.